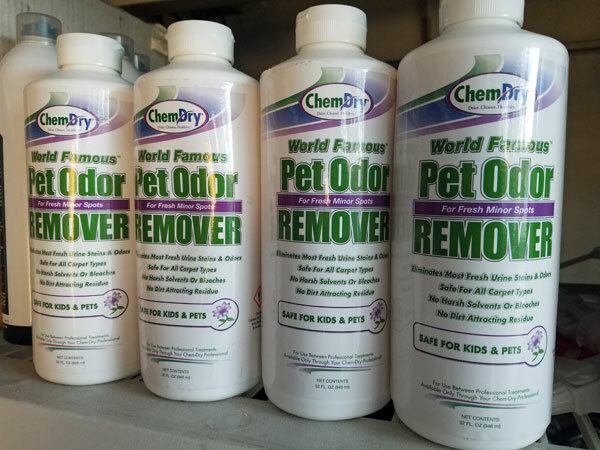 My favorite Enzymatic cleaner for cat urine is Chem-Dry's World Famous Pet Odor Remover. This cat urine cleaner will knock the odor right out of your carpet or upholstery. If you have a cat that sprays or marks items in your home then The World Famous Pet Odor Remover is the solution for you. Don't be fooled by other enzymatic cleaners that come is a spray bottle and don't have the professional strength to get out tough cat urine stains. I have been cleaning carpets in Tampa FL for years and one of the biggest challenges that I run into is older cat urine stains in carpet. Cat's have uniquely smelly urine that has evolved over time to help cats ensure that their territory is well defined by the odor of their urine. Cat urine is made up of a lot of things but the most problematic component is Uric Acid. Sometimes called urine salts, Uric Acid absorbs moisture and releases Ammonia and Carbon Dioxide giving urine it's unpleasant odor. Enzymatic cleaners breakdown the Uric Acid so it can no longer off gas. These cleaners work best on fresh cat urine deposits, but they can be effective on older ones as well. Just make sure to ditch the trigger sprayer on these cleaners and pour them directly on the soiled area instead. They take time to work and should stay wet for at least 24 hours to properly break down the Uric Acid. Letting them air dry or covering them with a towel will help insure that it stays wet long enough to be effective. If your looking for a cat urine cleaner in Tampa FL call Chem-Dry of Tampa.